Kicked out of school for being a victim. That's what some parents say is happening to their kids who were bullied at a South Bay school. Anoushah Rasta reports. Kicked out of school for being a victim. That's what some parents say is happening to their kids who were bullied at a South Bay school. San Jose police said a group of students beat up some other kids last week on the Mt. Pleasant High School campus in San Jose. But the parents of the alleged victims said their kids are being kept away from school, while the alleged bullies can return to campus. The parents of at least two students from Mt. Pleasant High tell NBC Bay area their kids are seen in video getting punched and kicked by a group of other students during school hours. 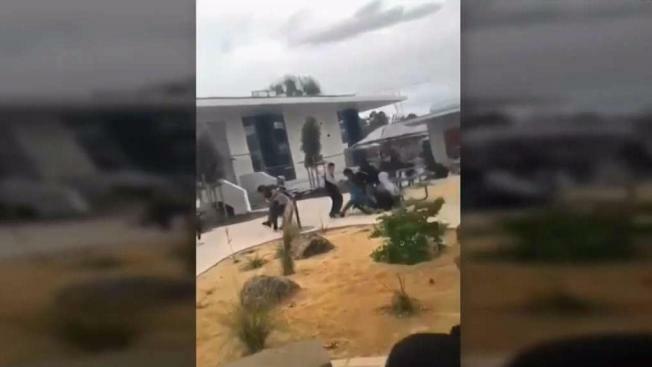 "They started a fight and the consequences we get is this -- they're sending us home," a student victim said in an interview with NBC Bay Area. The student did not want to be identified because of safety concerns. He said the principal told him and his parents that he is not safe at school anymore and should finish the last three weeks of the semester from home. "They gave us papers so we can get independent studies," the student said. "So we go home and we're going to get a packet from all our teachers." The student's parents and others who said their sons were also attacked claim the kids have been bullied by the same students since February. Parents insist that is when they first reported it to the principal and the school district, but nothing was done. Police said officers arrested two students responsible for the fight on suspicion of assault with a deadly weapon. Meanwhile, the principal of the high school will not comment on the incident or any of the parents' claims. The principal also said an investigation is ongoing.